Navdeep Bains, Minister of Innovation, Science and Economic Development. Ottawa is pushing venture capitalists to help fix the gender gap in the Canadian startup scene, telling those who want to qualify for a $400-million funding program they must "demonstrate how their strategies would advance these objectives." In its call for expressions of interest for the program to backstop venture capitalists, to be posted Monday, the Innovation, Science and Economic Development department states it requires all applications received by the Feb. 23 deadline, to "address the improvement of gender balance among Canadian VC fund managers," adding funding recipients's progress will be evaluated annually. The program's goals "includes a comprehensive focus on enhancing diversity and addressing gender balance among VC fund managers and portfolio companies," the document says. "We are sending an important signal we believe that … diversity is important and that in itself can lead to better returns," one government official said during a background briefing with The Globe and Mail. 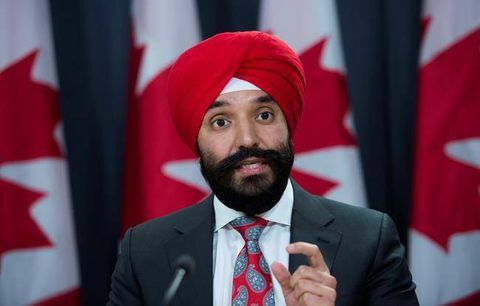 Innovation Minister Navdeep Bains said in a statement: "The goal … is to support the growth and scaling up of our best startups and turn them into global champions." He added he is "proud of the fact that this … is putting forward concrete steps to promote diversity and gender equality in the innovation ecosystem. An open society that values a diversity of ideas and perspective is good for business." The move was welcomed by those advocating for improved gender balance in the male-dominated top ranks of tech and VC firms. "This is a great way to have the private and public sector partnering to advance diversity," said Jodi Kovitz, founder of #movethedial, a Toronto organization dedicated to fixing the gender gap in Canadian tech. "We'll achieve the best results [attracting investment to the sector] if we are focused on bringing the full talent pool … to the forefront." The VC fund program, promised nine months ago in the budget, is a sequel to a similar initiative by the previous Conservative government that helped stimulate the Canadian tech sector. The earlier program, combined with provincial and private money, generated $1.4-billion for VC funds and led to a surge in financing for startups: In 2016, Canadian firms secured more venture capital (VC) – $3.6-billion, according to Thomson Reuters – than in any year since the dot-com bubble. The past government aid as well as the arrival of new, entrepreneur-led funds have helped domestic venture capitalists shake off their reputation as underfunded, underperforming, risk-averse financiers. At the same time, a new crop of surging startups they financed have led a tech renaissance here, spurring the Liberal government to launch such innovation-friendly moves as funding artificial intelligence, clean technology, a so-called "superclusters" program and easing the immigration process for skilled foreigners. Still, venture capitalists lobbied fiercely for a follow-on program, saying their industry needed it to become self-sustaining and to support the blooming tech sector. "The [new] program is a huge step forward…that will allow the Canadian VC industry to keep its foot on the gas at just the right time," said Mike Woollatt, chief executive of the Canadian Venture Capital and Private Equity Association. Government sources said the program's gender requirement, which was neither mentioned in the budget nor in a recent government discussion paper about the program, was directed by the Prime Minister's Office. The government has positioned itself as a progressive regime by naming a gender-balanced cabinet and with such initiatives as a $70-million fund to finance women-led tech firms. Studies have shown tech firms with women in senior roles outperform those with none. While the new program is otherwise broadly similar to its predecessor, it contains some notable tweaks. Similar to the previous plan, the $400-million, to be managed by Business Development Bank of Canada, is split into two chunks, with the biggest, a $350-million pool, earmarked for fund-of-funds managers – investment firms that distribute money to venture funds that in turn invest directly in tech firms. But where fund managers had to raise $2 in private capital for every $1 from Ottawa before, they now must raise $2.25, a move by Ottawa to press VC firms to eventually wean themselves off public aid. Like the prior program, the government would invest in the funds, but would only get any money out once private investors receive their full capital back plus a 7-per-cent return. Last time, Ottawa chose four funds-of-funds, which each raised between $300-million and $375-million. This time, Ottawa says the funds can range from $150-million to $400-million each. Winning fund-of-fund bidders must ensure 60 per cent of total capital goes to Canadian venture funds, and at least 35 per cent must ultimately go to Canadian firms. While that number may seem low, it's similar to the minimum under the previous program and is intended to make the funds-of-funds more flexible and attractive to private investors. Officials noted about 80 per cent of funding in the last program went to Canadian firms despite the low threshold, adding bids that pledge higher Canadian content will get more consideration. The other key difference is how the government plans to distribute the remaining $50-million. Last time, it injected the money into four high-performing venture funds. This time, Ottawa proposes to bankroll "alternative investment" fund managers not typically supported by funds-of-funds such as those investing only in women-led businesses, focusing on Indigenous or immigrant entrepreneurs or those that provide so-called "matching" capital or raise venture funds one deal at a time. Winners will be chosen by Mr. Bains based on recommendations by a selection committee of six industry experts. The recipients are expected to be announced in spring.